Are you ready for the best week of your life? Ready to jump straight into University life? Here we offer you an exclusive and all-inclusive start to your journey here at York. Constantine’s Student led Association has worked hard to plan an action-packed week with the best events and activities for you to enjoy during your first week! For the club goers out there, Constantine will be heading out to four of York’s most notorious student night clubs and will be holding on campus parties and pre-drinks EVERY NIGHT! With a new theme each night and party battles against our Hes East rival colleges, you’ll never see a dull moment! Taking a more tamed approach? Want to get a bit of the night life and experience college activities too? Not to worry! We have planned a set of non-drinking and daytime alternatives that will show you what Constantine and York have to offer! To get a feel for the college atmosphere, we will be putting on different activities, including a trip to York’s Ten Pin Bowling alley, a Games Night, Pub Quiz and a Movie Night at the University’s own Student Cinema! Not enough?! We have only scratched the surface… With each new day comes a new experience to do with the College and University. Aside from getting you involved with all the College has to offer, we will be sure that you are oriented with your surroundings, are comfortable in your new home, and are entertained at all times. Nightly Club access to York Parties exclusive venues! We will take you on a night tour of York, ending up in a different club every night of the week! We hold the parties, you bring your party spirit! Dress up for our themed club nights and join Constantine in painting York with our #PinkArmy! 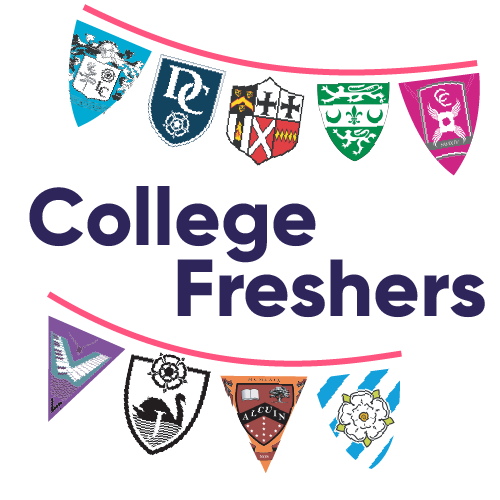 Look out for the Freshers timetable, out soon on social media! Clubbing not your thing? Not to worry! Constantine hold alternative events each night! Whether you fancy a trip to York’s Ten Pin Bowling, or a relaxed night in UoY’s Professional Student Cinema, we will be sure to provide entertainment! Constantine are just as active on Campus as we are off campus! Look out for all of our Energy Driven Daily activites – enjoy a free PRO Yoga session in the Forum, or come see our assault course, and become the fastest Constantinian to run the field! Get Ready for the Biggest Pink Army YET! #PinkArmy – look out for our snapchat filter when you arrive! The Best Freshers Experience! And Merch – see below! Wanting to experience Freshers Week again? Well this ticket gives you access to all non-drinking and day events hosted by Constantine College and access to club nights in Revs and Kuda. Both events will be themed and a predrinks will be hosted in the Forum.